This house was built by Mr. and Mrs. H.P. Jensen, some of the earliest settlers in Danevang, on a farm approximately one-half mile west of the current site of the Museum. Members of this family occupied the house for many years, after which it was rented out. 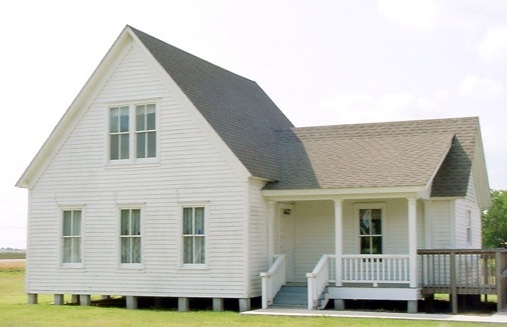 In 1993 the house, unoccupied and in a serious state of disrepair, was donated to the Danish Heritage Preservation Society and was moved to the site designated for the Museum. It was restored to near original configuration with most of the labor provided by volunteers from the community. This task included building a new kitchen wing to replace the original kitchen which had deteriorated beyond repair. The house was then furnished with furniture and appliances from the period of time before 1920. It was opened for display in 1998.